Sailing half around the world. As I was roaming the internet in search for my own yacht and right after my first test run with SY OLIVIA (read full article here) I crawled the net for more information on the Fiskars King´s Cruiser 33: I sucked in virtually every website, thread and note about that boat I could grab. One website was of particular interest as it was not just solely about the sailing yacht herself but also about an interesting project: “Half way round”. 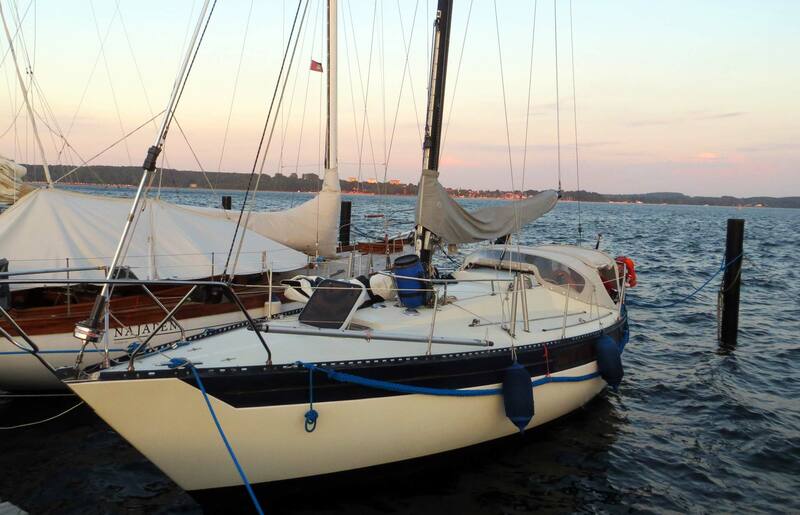 Three friends, one King´s Cruiser 33 and a plan to half circumnavigate the earth from Kiel/Germany to Cairns/Australia. I kept on reading. Gained a lot of information on the King´s Cruiser 33 and made a note to later seek contact to the three. „Be brave – have no fear“, says the circumnavigator. Lars Reisberg | NO FRILLS SAILING.com: Robert, thanks so much for giving me that interview and letting us participate in your experiences with your half-way-round-project. “Be brave, have no fear.” Is the one sentence that comes to your mind when asked about the cruise? Why? Robert | SY CELLO: Well, probably because this trip is the ultimate thing of my life up to this point. And having the guts to do it, to do the first step is – from my point of view – the most important thing it takes. 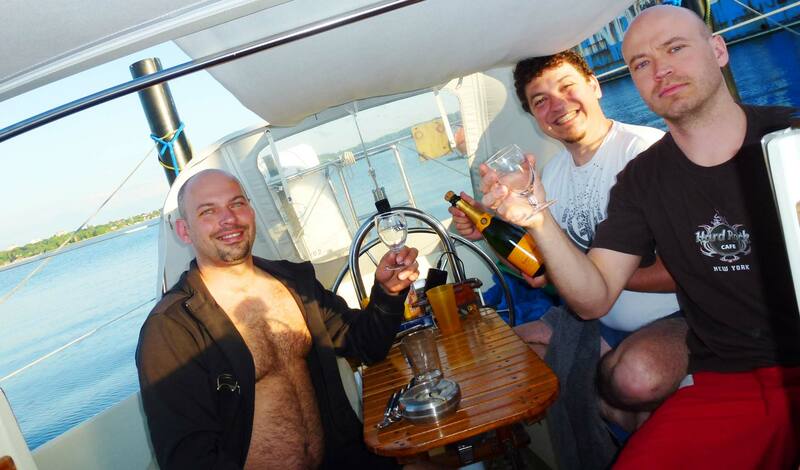 It´s not so much your competence in sailing, your skills as a yachtmaster. It´s this very hard first step – being brave. 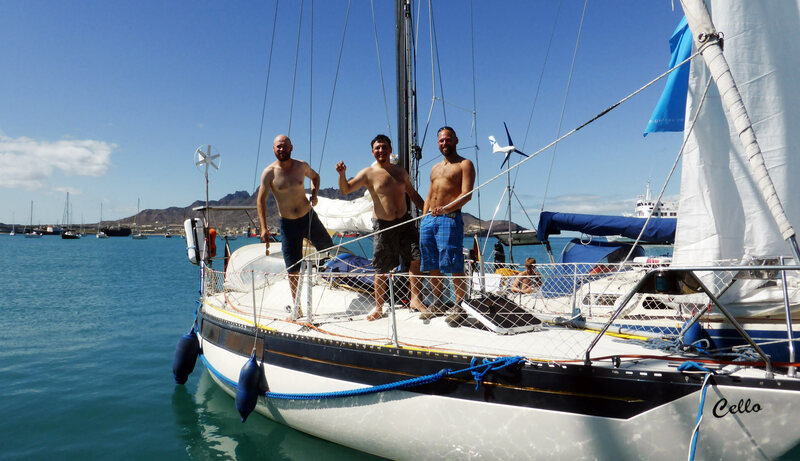 The SY CELLO crew reached Cap Verde – ready to cross the Great Blue. NFS.com: Tell us more about your project. Rob: Well, Siggi, Raimund and me … we are friends since we were kids. Our grandparents are siblings so we know each other for our whole live. 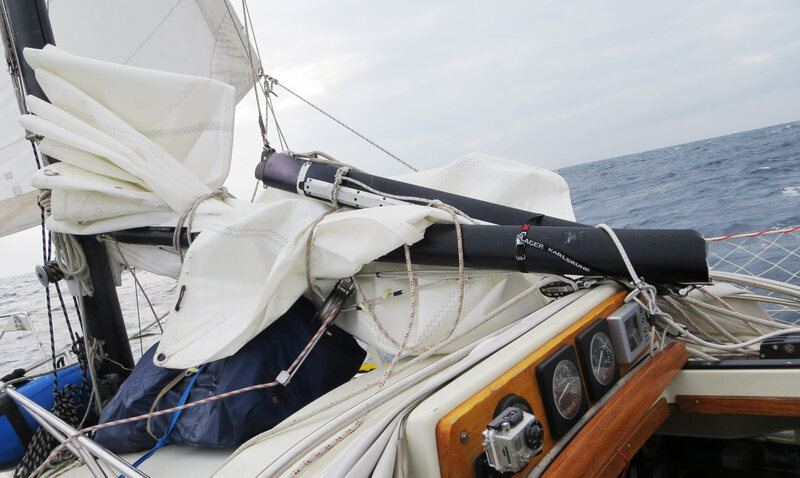 Raimund was the one who originally implanted the sailing virus in our crew as he was the one who accomplished his SKS (equivalent to the RYA Coastal Yachtmaster) and spent – as he was putting it – “the holiday of his lifetime” aboard a sailing yacht. He was playing with that half-way-round-idea in his head for quite some time, every now and then raving about his sailing trips in the Mediterranean. Since I liked ships as well I did my yachtmaster SKS in 2013 too we both decided to put his ideas to a real agenda. Rob: … yeah, Siggi. The third man. One nice evening we told him about our plans and despite the fact that Siggi hadn´t had never ever set a single foot on board a ship, he was totally on line and enthusiasticly supporting our idea. So we went on as a party of three. The second most-important crew-member … the cook. NFS.com: Going half way around the world was set. How did you plan the whole project then? Rob: Well, as simple as that: We all hadn´t even agreed on one single premise. Everyone had his own. One of us just wanted to cast off as quickly as possible, no matter what. The other didn´t wanted to spend too much money. I for myself had set my priorities to take the time needed, plan everything fully through and have everything set just perfect prior leaving. 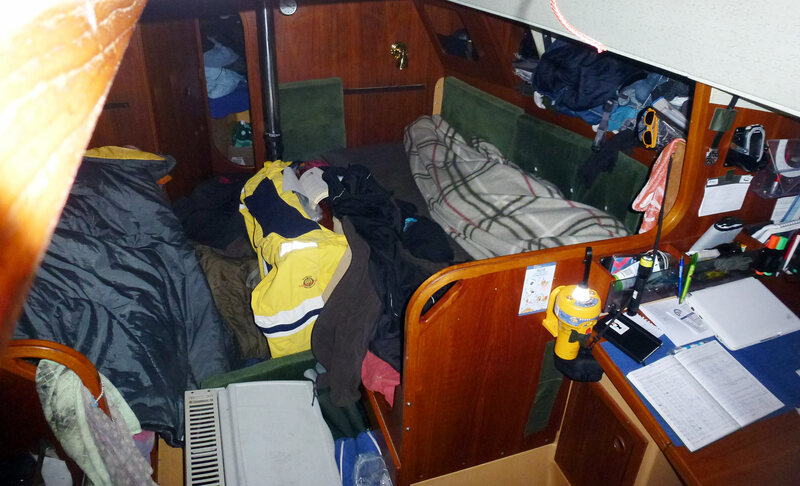 A boat´s saloon half way through. NFS.com: But finally you all agreed and set a course, bought a ship and set sails. „Half way round was meant to take us to Cairns, Australia“ – but sometimes reality bites. NFS.com: So casting off in Kiel and going through the Kiel Canal is something I am quite familiar with since I was taking my own King´s Cruiser through Kiel Canal as well (read full article here). What was next? 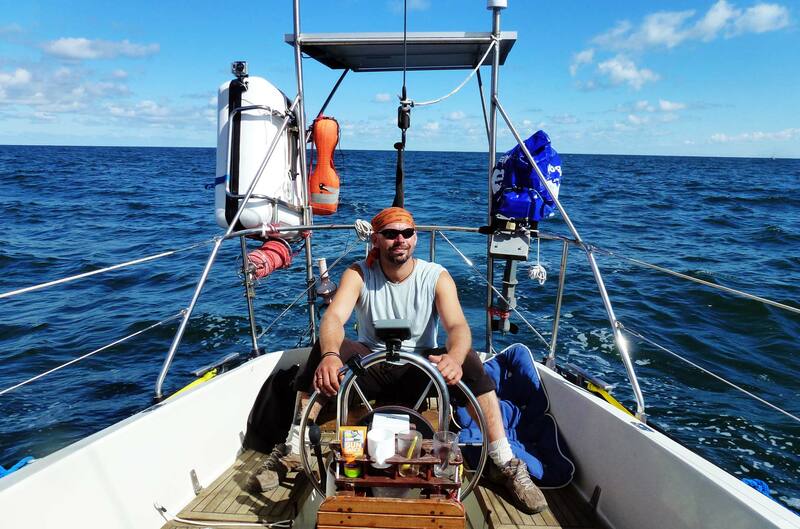 Rob: The winds initially were not favoring us so we had to sail via Helgoland at first. 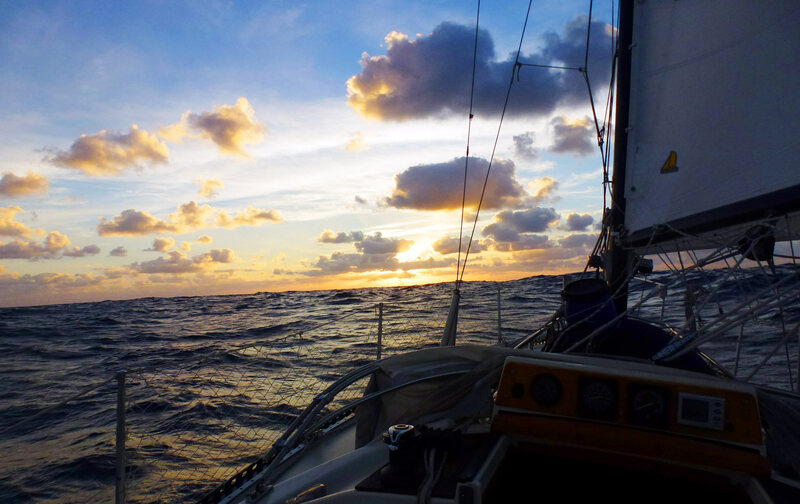 Going through the Channel and the Biscay in late August was a bit risky and indeed put a lot of stress in the rigging of our yacht. But interesting to sail here. 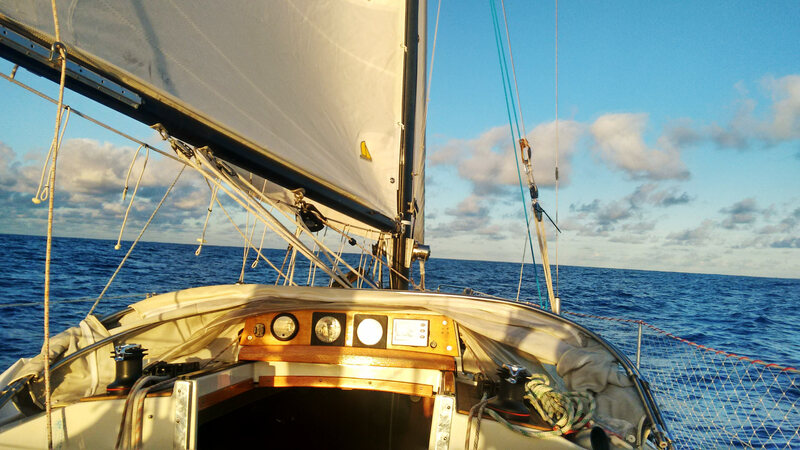 We then took the classic route to the Cap Verde Islands to catch the tradewinds which should bring us all the way into the Caribbean within 18 to max 25 days. 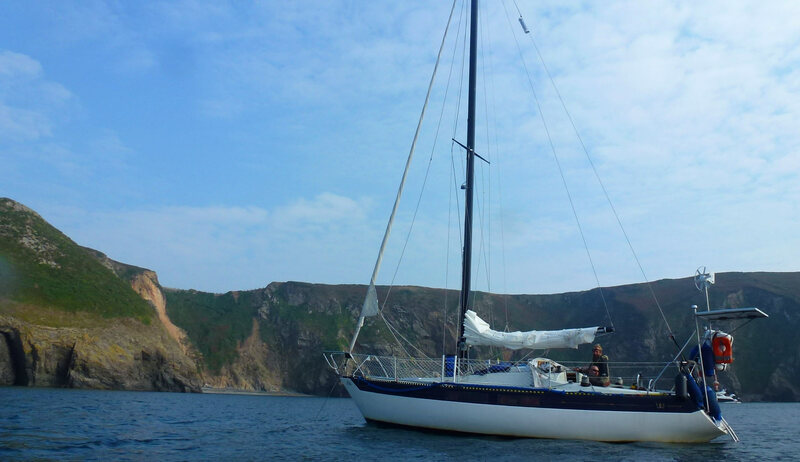 A foretaste of the Caribbean: The Channel islands of England. Rob: … yes of course. And one we were particularly longing for very much. 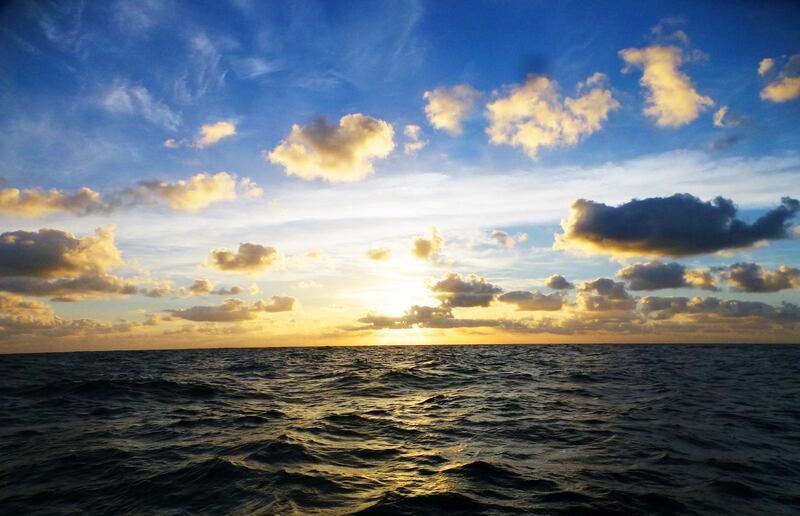 We have been more keen on reaching the Pacific Ocean than in crossing the Atlantic. So we planned to stay in the Caribbean for a month or so to roam about and hop from island to island to then cast off to the Panama Canal and change oceans into the Pacific. That was where we all wanted to go. Rob: … Pacific is the real Ocean. So alien. So big. So far away. 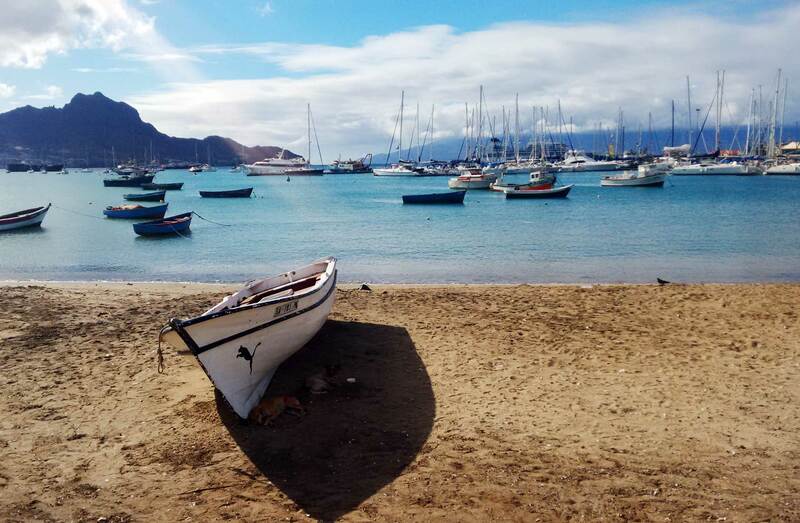 Our dream route was to sail to the Galapagos Archipelagos and further on via the Easter Islands to finally end the trip in Cairns in Australia. One half of our planet. 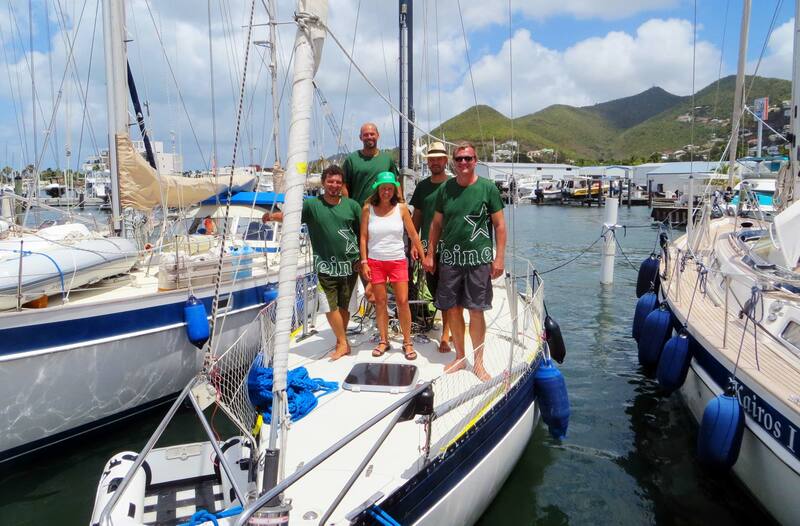 KIngscruiser 33 SY CELLO sailing from Dominica. NFS.com: But SY CELLOs crew was only able to take her one half of the half. Why? Rob: It was a chain of bad things happening. As I said earlier, it began right on our first day of the project when we decided to start as early as possible with less possible financial investment. So we had to prepare everything in very short notice – next to our full time jobs. So in the end that was leading to a boat that was not fit as fit as it should have been to safely cross the Big Blue: We had our mainsail ripped apart the third day into the Atlantic crossing, a broken shroud on the fifth day and another shroud broken on the twelfth day. We were able to fix the stuff more or less but every second day the repaired shroud broke again. So we had to go under reduced sails all the time which made us very slow. 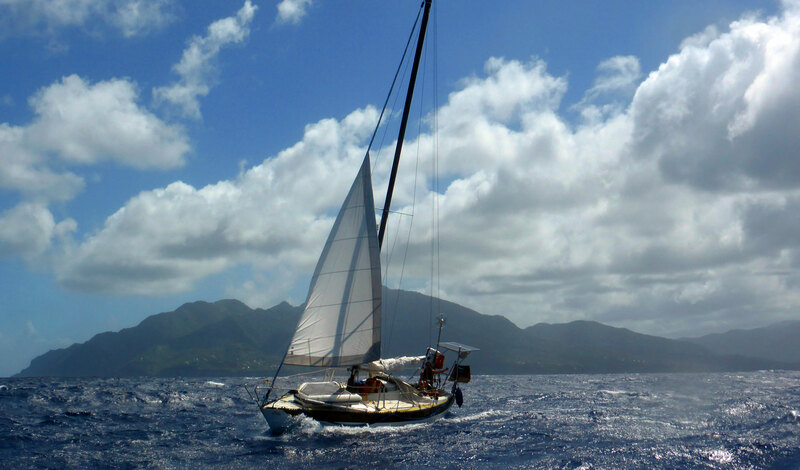 Arriving in Martinique we also discovered a developing breach of the backstay which made the failure complete. 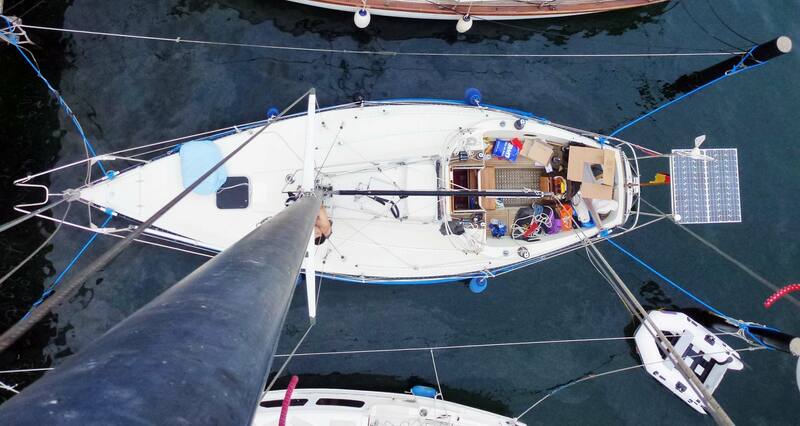 It took us 24 days in the end to cross the Atlantic and wait for three more weeks for the new rigging to arrive. That time was lost. Since we all wanted to spend time in the Caribbean and not sprinting onwards to the Panama Canal, we had to admit to reality and cancel the second half of the project in favor of some holiday cruising-time in the Caribbean. Rough seas, sailing with Genoa exclusively. NFS.com: So looking back it is still the holiday of your lifetime? NFS.com: No, it´s not too much money. 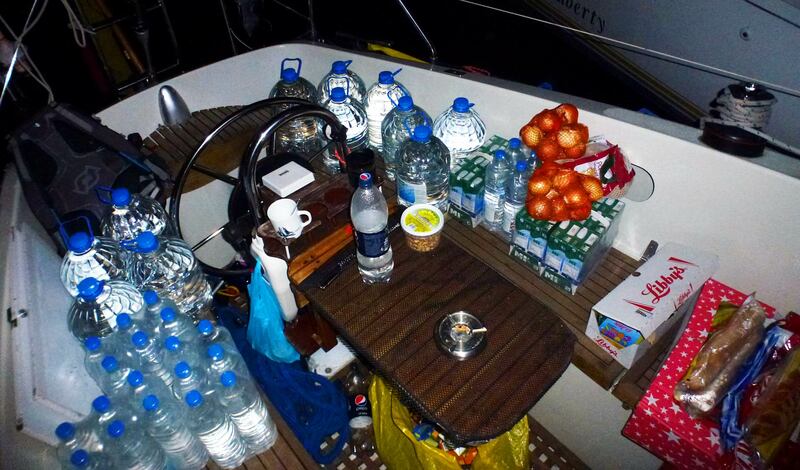 So I guess there were some 25.000 Euros to pay for the boat and some more for further equipment? Rob: That’s correct. 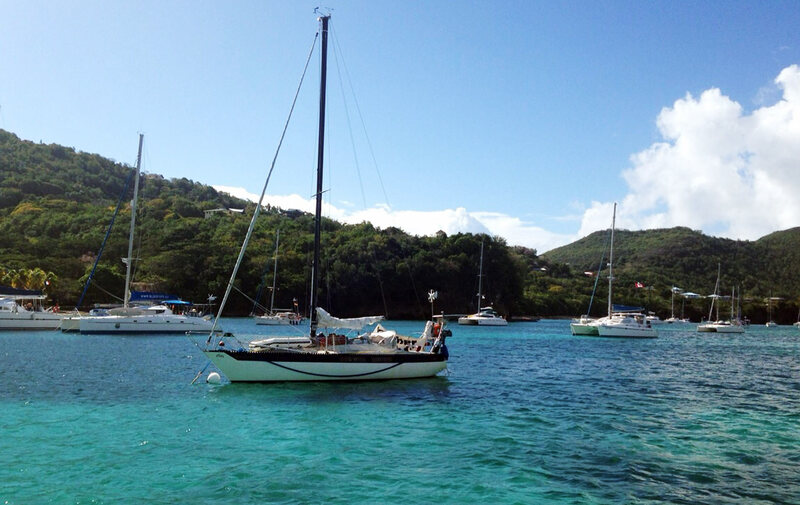 We´ve had no less than 24 appointments with yacht owners willing to sell their boats. It was quite disappointing to see that the vast majority of the boats were in a miserable and terrible condition, not worth a thousand Euros if you ask me. In the end, we´ve had two boats to choose from: The King´s Cruiser 33 and a DIY yacht made from Aluminum. We´ve never heard of a yacht builder named Fiskars before but Internet said it was a good brand and the 33 particularly had – not overwhelmingly much – but quite a good reputation. NFS.com: So you took her because of what? Rob: Well. The Aluminum-yacht would certainly have been the better boat in terms of sailing abilities. It was a very neat, sleek hull made to go fast. Definitely the better choice if speed was the number one priority. But we decided to go for the King´s Cruiser for several reasons. First: Here you have a ship of a whole family so there´s a proved design and line of production. Since our boat is number 171 of 200 you can be sure of getting a mature product – not so much with a DIY self made boat. GRP is a construction material that can be repaired by almost everyone almost everywhere. Aluminum is complicated. And the comfort as well was big point: The King´s Cruiser simply is a cruiser. Made to make a sailing trip into a holiday. And going half way around the world the how you go is of utter importance. NFS.com: And as far as I know, at least one King´s Cruiser 33 has made a complete circumnavigation. Rob: Indeed. We´ve had a good feeling about the boat. Rob: She is made of a strong, sturdy quality. Her hull is thick – no comparison to nowaday´s “joghurt-cups”. I was very impressed of her solidity. Being almost 40 years old, she was making a very fine impression and looked so well that we couldn´t believe our eyes. The pre-owner had a built in bow thruster, completely senseless for a boat of just 33 feet length, but anyway. We signed the contract of purchase in May 2014 – and we were casting off in August. 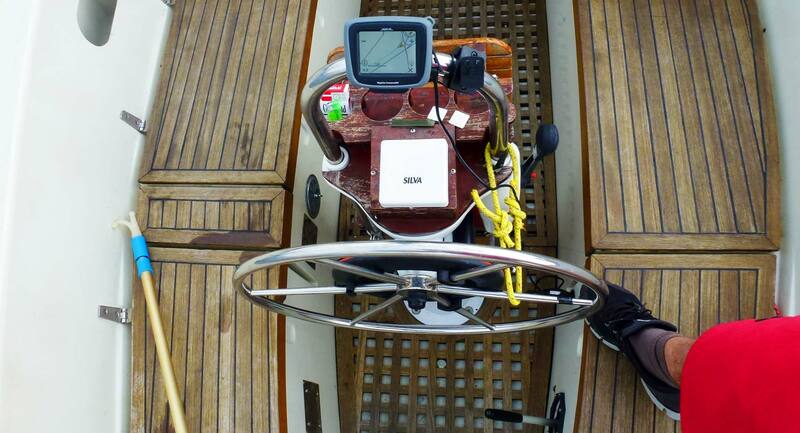 Just four months time to get used to the boat, make her fit for the voyage … that´s pretty speedy. King´s Cruiser 33 with wheel helm. NFS.com: How did you train? Rob: One step at a time. At first we just went out for one hour. Just casting off, doing a mile or so and going back to the berth. Next time two hours, more sail-area, back in again. Until we´ve made our first cruise from Kiel to the Schlei – the trip you did vice versa (read full article here) – and finally a test-run to Helgoland with our first ever night-ride. 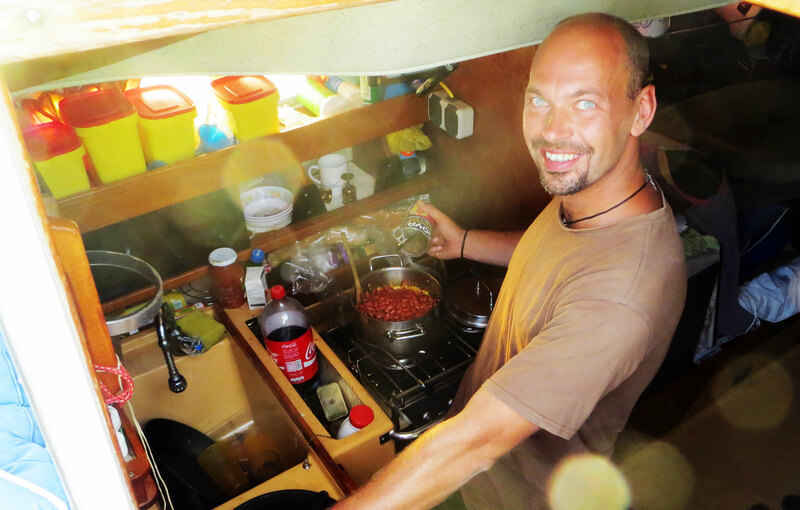 One step at a time … Raimund has had some 800 miles of sailing experience when we set sails, I had some 300 miles and Siggi … he was the cook (laughs). NFS.com: A clever procedure to train step by step I would say. Rob: Yes, it was the best and most effective at that point. But nevertheless, we simply had to lower our sights as well. Had we have more time, I would certainly have the rigging checked by a pro. And maybe he would have spotted the developing cracks in the shrouds and saved us a lot of trouble? Anyway, we didn´t and so the day of leaving was near sooner than we´d expected. NFS.com: What´s the story behind the name of your ship? Rob: Well. When we bought her she was named “Absolut II”. And despite the fact that we all found that this was a pretty stupid name – we also simply had no connection whatsoever to it. We all love music and we love to make music as well, even if I cannot play that good. So it was clear from the first day on that we would take some of our instruments with us. We had a guitar, two harps, one concertina, a trumpet and a sax on board and we could have taken with us a cello as well, but that´s a huge piece of wood so we left this one at home and christened our ship SY CELLO instead. Christening the Kingscruiser: SY CELLO is here. NFS.com: That´s a nice one! Rob: Indeed. Along with the instruments, we had all in all six sails. Three of them were old canvas, a main, a genoa and a jib. 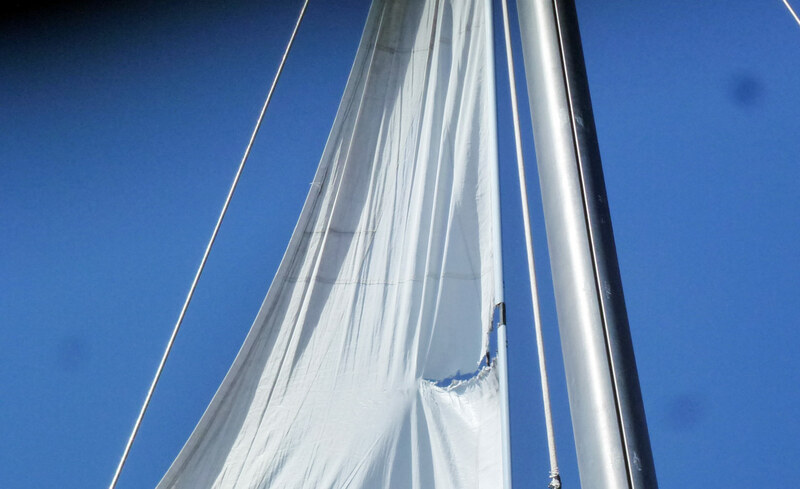 We´ve had an old blister organized and we additionally bought a mainsail and a stormsail of new quality. So, my advice for everyone would be, to invest in good sails in advance and to have at least two of each sails in high quality. 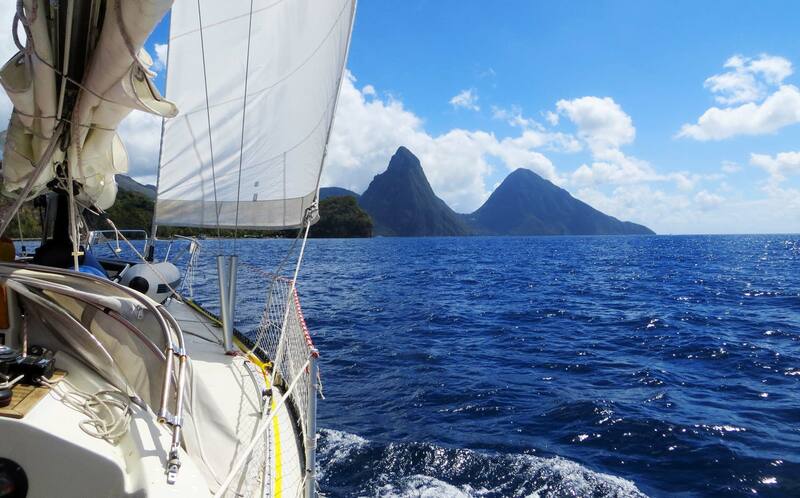 It´s a sailing boat – don´t save money on sails! Champaign to a lucky voyage. NFS.com: Which other key equipment did you have on board for the cruise? NFS.com: Let´s talk about the daily business while underway. What´s about having dinner on board? Rob: Well, Siggi was our cook and he did a marvelous job! I must admit, we all hadn´t such big pretense to what we eat as long it was plenty of it and it was tasting good. So, most of the time Siggi was preparing pasta and various styles of sauces. Since we wanted to save precious energy we hadn´t had our fridge on the grid – the engine wasn´t running a single time during the Atlantic-voyage! – and so we couldn´t take with us meat or such things. So yeah, pasta all the time. Planning provisions is a science for itself. NFS.com: Did you go for fish? Rob: Hell yeah, we tried! But this year apparently there was a big, big season for seagrass, the water was full of it – all the time! So our baits got tangled up all the time within the seaweed so we quit fishing. Oh wait, we catched one Calamaris. But that´s pretty much it. Fresh stuff like Bananas or Oranges was out after roughly one week – but having only canned food and no vitamins was no problem for two weeks. But anyway, we didn´t need fish or fresh food. We´ve had plenty of stuff, even “luxury”-food like chocolate, nuts, cookies and jelly. So from a nutritional standpoint it wasn´t the healthiest of all crossings I would say, but we were able to regularly fill our stomachs with tasty food. NFS.com: What and how much did you drink? NFS.com: What was spending X-Mas on board like? As we have seen in “Das Boot” or something completely different? Rob: (laughs) Well, no and yes. It was a special day for us indeed, but not in the classic sense of Christmas Eve itself but from an emotional view. 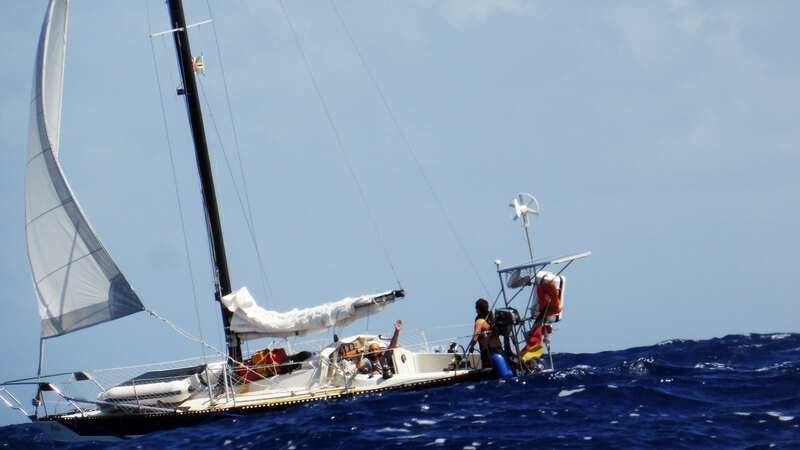 We had planned to having reached the Caribbean well before Christmas and realizing that we´d had to spend it on board SY CELLO still underway was a thing of mixed emotions. See, we have told our families that it would take us 18 to 25 days to cross the Atlantic – 18 to 25 days until they could expect a word from us via Internet or phone. We took full 24 days to cross the ocean but family members started to worry about us from the 18th day onward, creating a fearsome feeling within our families during the Christmas time. We knew that. And having no chance to communicate was a bit depressing in this way. On the other hand, right on Christmas Eve we saw the first, one and only blimp on the AIS-Screen for the whole crossing! Like the Christmas star. It created euphoria in all of us, seeing other people after 20 or so days was a big thing. NFS.com: So you celebrated with them on the radio? Rob: At first they didn´t answer via radio. They came up quickly, it was a yacht, but I think the autopilot was steering, nobody on the mike. Just as they overtook us and we had them within screaming range, somebody heard us making noise and came on deck. It was very nice to talk to them. Later that day we sang some songs with our guitar and had a couple of glasses of Rum. But that´s it for Christmas: No tears, no phony classic Christmas-songs and no gifts neither. Just a men´s party I would say. NFS.com: Going back to the King´s Cruiser 33, what would you say are the weaknesses of the boat, or your boat in particular? Rob: Right so. Second thing was the engine. Well, it was running smoothly and we´ve had no major problems at all, but the BUKH-Diesel was old. Very old. I couldn´t spot a plate stating it´s year, but the pre-owner said it was her maiden engine, so, built in 1977 you can imagine his working hours … we´ve had a saying about our engine: Better not maintain! Every screw you wanted to lose and tighten again broke at an instant because the whole substance was just very old and worn out. We´ve had the classic palette of spare parts like filters and v-belts, but we got used to live with a leaking fuel-pump. After opening it, it was clear that the whole stuff was too old to be repaired thoroughly. We avoided other operations for fears of not being able to securely complete them. So yeah, these were the major flaws of SY CELLO. NFS.com: You also told me about a bigger leak in the bilge? Rob: Yes, but it was not the bilge leaking, it was the stuffing box of the rudder shaft. We didn´t spot that flaw prior casting off. I must admit, the pre-owner was hiding that leak very cleverly – always drying the leaking water with kitchen paper or alike shortly before we arrived. 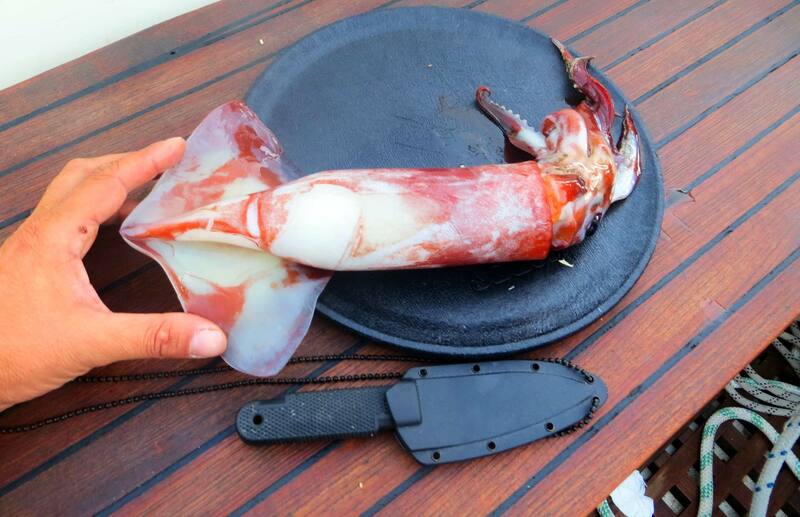 And we spotted the big problems when out on the high seas. So we had to pump dry the bilge on a daily basis. Very annoying. 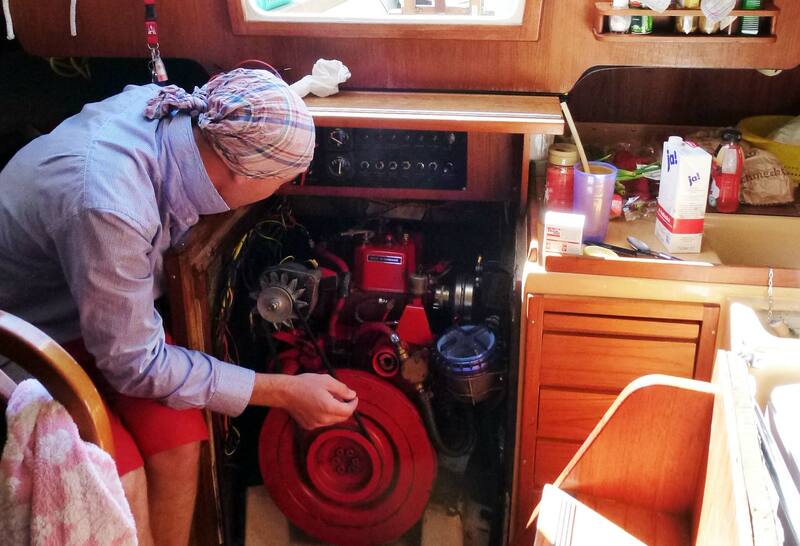 Inspecting the Diesel engine of the King´s Cruiser 33: The BUKH. NFS.com: Did you confront the pre-owner with that? Rob: … comes around. Right. That would be my strong advice to everyone thinking of doing such a Blue Water-project: Invest a lot and go through every point of your boat very precisely and take your time! 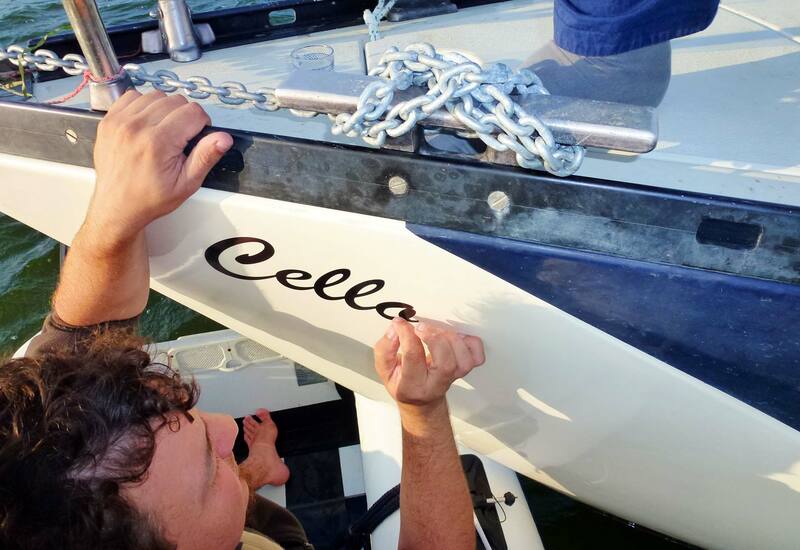 It´s certainly not a waste of money to have somebody specially educated taking a look onto the crucial parts of your yacht. Take with you a lot of steel-ropes, idlers (for pulleys), spare shrouds and minimum is two full sets of new sails. That´s just a matter of safety! NFS.com: Speaking of safety, what kind of equipment did you have with you? Rob: Well, the standard minimum-package I would say. Vests of course, a life-raft and EPIRB. That´s pretty much it. We invested in a new radio with DSC because having the opportunity to send our distress calls in a matter of seconds was something I didn´t want to miss. (read more on radio, SRC-Certificate and DSC distress calls here). Lifebelts and lifelines have been installed and it was customary to wear the gear in heavy weather conditions, but not all the time. NFS.com: You mentioned not having started the engine for the whole time of the Atlantic crossing, tell me more about the energy management on board SY CELLO. Rob: We´ve cut off every unnecessary consumers from the grid when we left Kiel. Such thing as the fridge for example. In the same instance we installed a wind-turbine and solar-panels for power generation underway. But the wind-turbine was undersized and couldn´t contribute as much as it could have, because we´ve had steady, fairly strong winds all the time. But the solar-panels were marvelous. Their performance was sufficient enough to regularly reload our batteries. Restraining to the most crucial current consumers our power management was absolutely sufficient. NFS.com: What was the most exciting moment of your half way round-trip? Rob: As Raimund would say: “Reaching the other side is the coolest thing of it all!” Having crossed this vast ocean is … well, I even now cannot find the right words, word that would describe what we´ve seen and what it feels like to be out there, alone, just you, this desert of water and there is just nothing else and nobody else. It´s mind blowing. Lonely? That´s why we are here! NFS.com: So reaching the other side was coolest? Rob: Just awesome! The vast Ocean, the myriad tones and shades of blue. Fluorescent plankton. Dolphins all around, swimming with turtles I will never ever forget in my whole life. Nightfall – darkness, it´s overwhelming seeing that amount of stars, unimaginable in Europe. I had never seen so many stars in my life before, a mind blowing experience as well. My favorite island was Dominica. Such a wonderful perfect place, a small paradise. And Caribbean Mardi Gras is a big party you shouldn´t miss as well. It´s really hard to return home. NFS.com: So you left SY CELLO and sold her there. How did you come home and what was it like? Rob: Oh my. That was kind of heartbreaking. Even if our King´s Cruiser wasn´t the fastest of all boats and had brought with her a lot of trouble, we loved our boat as it was a safe home for nine months. Leaving her and selling her to an unknown person is still a troublesome feeling for me. We booked flights back home and there were a lot of welcome-parties of course, but returning is hard. Having guests on board in St. Martin. NFS.com: So, back on deck as fast as possible? Do you have plans for future trips? Rob: To be honest, at first I said: No more sailing for me, thanks. But now, some months after the cruise I am making plans indeed. Maybe nice little charter-cruises with my girlfriend or friends in the Mediterranean or kind of. But no, we don´t have “big” plans like you might have in mind. Not for now. NFS.com: Rob, last question: What´s your hint for all of us dreaming of doing such an adventure for ourselves? No one around: Just pure nature on the ocean. Thank you Robert for that interesting and exciting interview and sharing your story and advice with me and the readers of NO-FRILLS-SAILING.com, it was a pleasure taking part in that story! If you, dear reader, want to get more information on that Half-way-Round-Project, please visit their website for a lot of pictures and a (b)log of their trip. I live on probably the only Kings Cruiser 33 in Australia,named Draumen,sailed out from Norway.Would be good to find out her history if possible.Good boat,I am very happy with it.Keep the articles coming. that sounds great! Submit some pix if you want. Previous Post	Short Range Communication (SRC) Certificate. Next Post	First milestone completed.